The Ukraine Solidarity Campaign is issuing the following appeal from the trade unions representing workers at the ArcelorMittal Kryvyi Rih, the giant plant in the Ukrainian industrial metropolis of Kryvyi Rih. Recently the miners of the city made significant gains in their dispute with the company EVRAZ. The workers of Kryvyi Rih are setting an example to the labour movement of all Ukraine in this difficult time. Ukraine Solidarity Campaign, a labour movement based campaign in the UK will be doing its upmost to assist them in their struggle with this corporation which is profiting from the misery of the Ukrainian workers. We appeal to all sections of the labour movement to assist. Please republish the appeal below (translated by Olga Papash and Nick Evans) and circulate it as widely as possible. Our company is the world’s leading steel and mining company. It is one of the biggest assets of ArcelorMittal. Currently, it employs more than 30 thousand workers. Due to recent events in Ukraine, which led to a rapid increase in retail prices and shortages of some goods, real wages of the employees were reduced by more than a third. The living standards of workers lowered dramatically also because the tariffs for electricity, transport, and utilities increased according to the agreement with the IMF. At the same time, ArcelorMittal, which exports more than 85% of our products, has got a windfall due to the devaluation of the hryvnia exchange rate, which decreased from 10 UAH per 1 Euro in July 2013 to 16 UAH per 1 Euro today (in April, 2014, the rate was even lower, 18 UAH per 1 Euro). Thus, the owners of ArcelorMittal will receive more than 100 million Euros of extra income this year just by reducing the actual wages of the workers, that is, by robbing them. However, Kryvorizhstal is the largest city enterprise, and a social explosion there might lead to unpredictable consequences not only for Kryvyi Rih, but also for the entire region. In recent years, the wages at the enterprise were low, but now the situation has simply become intolerable. The workers of ArcelorMittal have been in dispute with the company management since May 2013 (Their complaint was officially registered with the National Mediation and Conciliation Service – №052-13 / 04-B from 07/05/2013). Since the beginning of this year, our trade union has repeatedly asked the administration to address the question of an immediate increase in wages. However, our requests were ignored. On April 11, 2014, the labour collective of ArcelorMittal Kryvyi Rih held a conference and decided to launch a labour dispute after failing to reach agreement with the management. The management ignored our demands once again. So, on May 22, the joint representative body of all trade unions of the enterprise decided to officially demand an increase in wages by at least 20% from 01.05.2014. The administration was notified with an official letter that if our demands fail, we will immediately proceed with decisive action. Unfortunately, the administration has not listened to us. For more than a month the workers of ArcelorMittal Kryvyi Rih have been participating in mass protests. Actions of solidarity were also organized at the office in Kyiv, Ukraine, and at some government agencies. The workers and the public expect ArcelorMittal to fulfil the requirements of the labour collective. However, unlike other Kryvyi Rih companies (including Kryvyi Rih Iron Ore Works and EVRAZ Sukha Balka), the wages at ArcelorMittal Kryvyi Rih have not been increased. 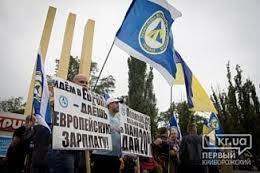 International solidarity and support for workers from outside Ukraine was one of the key factors that forced Evraz administration to accept the workers’ demands. The central office of ArcelorMittal is also situated in London and is definitely aware of the EVRAZ administration’s decision, but the management probably finds that what applies to Russian and Ukrainian oligarch extortions in Ukraine, does not concern the European and Indian ones. We are writing to you with gratitude for the support of all the workers of the Kryvyi Rih region and all Ukraine, and a request to support our struggle by solidarity actions at the ArcelorMittal headquarters in London, as well as at the company’s enterprises. The situation in Ukraine is very difficult. Military action is taking place a few hundred kilometres east of Kryvyi Rih. The main reason for today’s problems is undoubtedly the social crisis caused by extortions of the voracious oligarchy. To prevent the spread of civil war throughout Ukraine, and perhaps not only Ukraine, we need to stop the oligarchic robbery and restore social justice. Only social justice may be the true guarantee of peace in Europe! Justice to the workers is the first step towards peace in Ukraine and Europe! Chairman of the Ukrainian Independent Trade Union of Miners in Kryvyi Rih. from 01.05.2014 a raise in rates and salaries paid to the workers of the Joint-Stock Company “ArcelorMittal Krivoy Rog” by no less than 20% and to publish the corresponding order around the enterprise no later than 30.05.2014. If this demand is not fulfilled the joint legislative organ of the trades unions will move swiftly to take more decisive actions and will undertake all measures provided for under existing legislation of Ukraine to ensure the fulfilment of this demand.